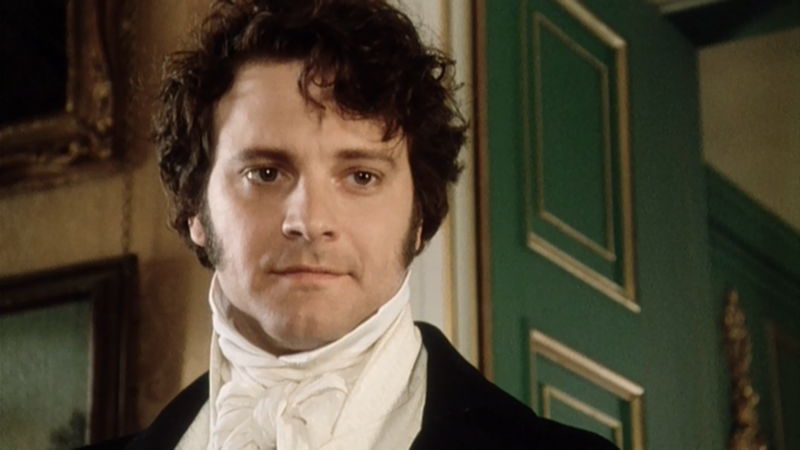 Even better that it signals Mr. Darcy’s ability to flirt. If pressed, I would argue that this is the moment when their courtship begins, as it proves Darcy capable of a kind of flirtation that can disarm Lizzy’s quick wit. It comes during one of my favorite moments in Lady Catherine De Bourgh’s parlor, shortly after Darcy and his cousin Colonel Fitzwilliam have arrived (and therefore before the marriage proposal and even the information that Darcy might have prevented Bingley from marrying Jane). It’s a terrific exchange — well worth reading the short chapter in full — premised on mutual teasing. (Is there anything more wonderful than mutual teasing in the early phase of a romance? Much better than a sonnet.) But it also gets barbed, because Lizzy still dislikes Darcy so much, and she doesn’t realize that his feelings are so much the opposite. I won’t recount the glories of this exchange, because if you’ve read this far, you surely know it. It’s the one in which they riff on Lady Catherine’s suggestion that Lizzy practice the pianoforte more, which she then uses to prod Darcy about his rudeness to the citizens of Hertfordshire. He tries denial, but ultimately he submits to her teasing. It’s not true, is it? As in, not really true at all? 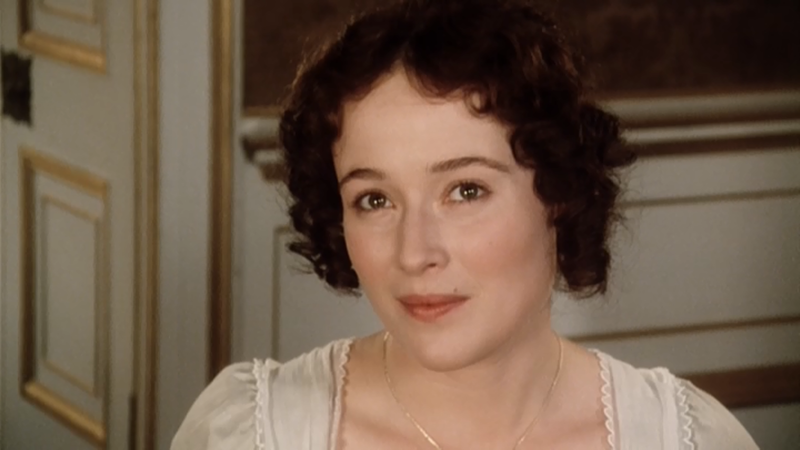 If anyone knows how to perform to strangers, it’s Elizabeth Bennet. She and Jane take great pride in being the kinds of intelligent, genteel women whom anyone would want at a social gathering, of whom any family would be proud. 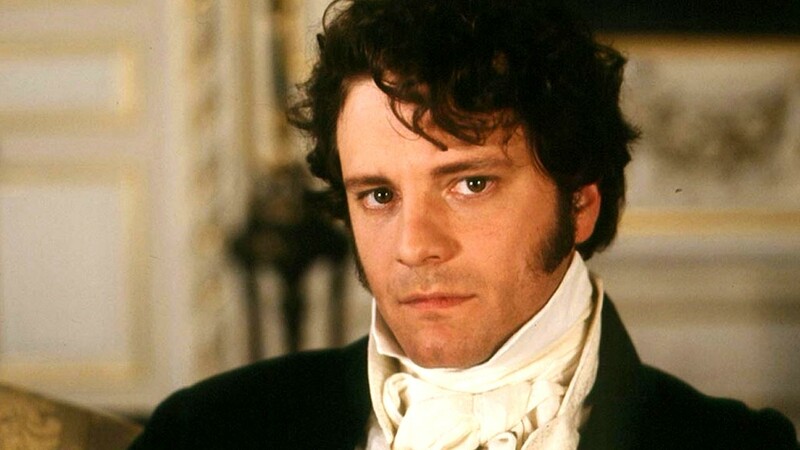 Indeed, Darcy has fallen for her in part because she moves with such skill and intelligence through a room full of people — skills he admittedly lacks (“I certainly have not the talent which some people possess of conversing easily with those I have never seen before”). He knows she performs to strangers. Why would he say the opposite? I suppose you could also say that it smoothes over Lady Catherine’s earlier cringe-making digs at Lizzy’s piano skills. “I have told Miss Bennet several times, that she will never play really well, unless she practises more,” Lady C pronounces, thereby embarrassing her relations. Darcy’s comment is a wholesale rejection of both Lizzy’s modesty and Lady C’s rude ignorance. But most of all when Darcy emits this opaque, confounding line, he undermines all Lizzy’s accusations about his character. She has teased him for being intimidating and rude, and he returns with a spectacular compliment about her playing. Even more artfully, he has defused her complaints about him by asserting that they are the same. “We neither of us perform to strangers” asserts the similarity between them; and it also establishes an intimacy between them, an intimacy of mutual recognition. Darcy may be largely wrong about Lizzy’s nature, but not entirely; he recognizes that her intelligence goes beyond what she shows in company. This line says, you and I understand each other; but it does something more: it forces her to imagine that intimacy. Delicious. In the book, Austen lets this line pass through the scene; but in the 1995 miniseries, the director allows this line to catch Lizzy a little short for lack of a response. Also delicious. Thanks for reading this opportunity for me to let my P&P freak flag fly. No more close readings for the time being, I promise. 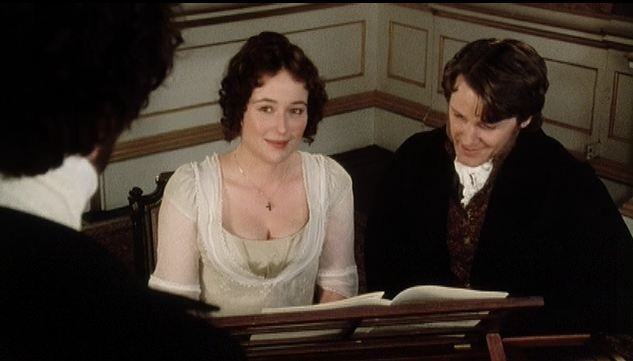 I love in that scene when Lady Catherine says I” would have been a great proficient – if I had learned to play,” or something like that, re: the pianoforte. While this my favorite P & P aside from book, I really like them all. Each version has something to recommend it. Ahh, I see I have a fellow obsessive here. Great dialogue. And yup, exactly the same chapter. Some wonderful analysis on a day when I can’t bring myself to do much. Check this out! 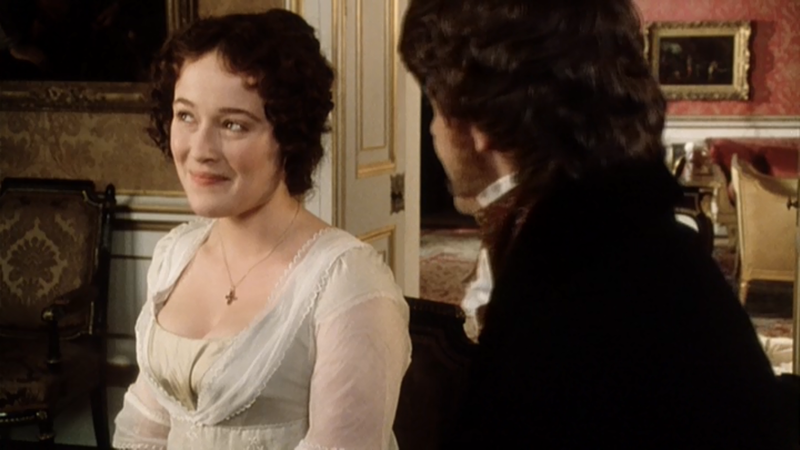 Lizzie and Darcy flirt (?). That is so astute – they are their own persons! Lizzie is obliged to bow more to convention (female, and of no fortune) , but she sets her boundaries. And Jennifer E, is, and remains my Elizabeth of all time. I am so with you on all of this. I just re-watched the series AND re-read the book, and they’re together such gifts that keep on giving. Every single time I read the book I find new lines to love. Not only is Jennifer my favorite Lizzie, I have come to like Jennifer herself so very much through her tweets. A down-to-earth, interesting, funny, socially conscious wife and mom as well as a fine actress. Love this analysis, too. One of my favourite scenes both in the novel and the BBC series. Both, Colin Firth and Jennifer Ehle, are brilliant! And funnily I just watch them perform “The King’s speech” together … Thank you very much for the analysis! I love this post!! 😀 I’ve always loved the scene, but never thought about it in this detail; I was too busy “ooofing”. Will have to go watch it now! Mwah! I don’t geek out over Austen much, so this was great fun! Love your analysis. They are both quiet thinkers, yes, with vastly more that could be revealed to just the right soul. You’ve turned an obscure comment to something lovely. Many thanks, Trudy — I just love the language in the book and getting the chance to write something like this is like rolling an Everlasting Gobstopper over & over in my mouth. Really enjoyed this post! Love your analysis of this line, one of my favorites in a wonderful scene. Your take on it reminded me of a (maybe similarly?) teasing line Elizabeth says to Darcy while they are dancing at the Netherfield Ball (which is the last place they saw each other before Rosings): “…I have always seen a great similarity in the turn of our minds. — We are each of an unsocial, taciturn disposition, unwilling to speak unless we expect to say something that will amaze the whole room…” Another great scene, that dance!